Garnet Hill has just announced naturally flame-resistant sleepwear. According to product descriptions, these pajamas are made of “55% modacrylic/45% cotton blend that is naturally flame resistant without the use of chemicals.” According to Wikipedia, “Modacrylic fibers, first produced in the United States in 1949, are modified acrylic fibers made from acrylonitriles.” Modacrylic is flame-resistant; however, it is a synthetic fiber. Therefore, I do not feel Garnet Hill’s new line of sleepwear is “naturally” flame-resistant, since the sleepwear is not made of natural fibers. However, the absence of flame retardants is to be applauded. Many people are concerned about our exposure to Polybrominated diphenyl ethers (PBDEs), the most common flame retardant in the US), especially since their presence has been found in breast milk (click here for USA Today article). In fact PBDE levels in humans are doubling every two to five years! Europe and California (starting in 2008) have already banned PBDEs; however, PBDE’s are not found in sleepwear but mattresses, computers, tvs, etc. 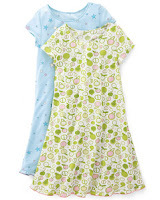 According to the US Consumer Product Safety Commission, “To prevent burn injuries, the U.S. Consumer Product Safety Commission (CPSC) urges parents to make sure their children’s sleepwear is either flame-resistant or snug-fitting. Loose-fitting T-shirts and other loose-fitting clothing made of cotton or cotton blends should not be used for children’s sleepwear. These garments can catch fire easily…” The safer, natural alternative I advocate is to provide your child with snug fitting cotton pajamas. The Green Guide writes, “Is fire-retardant sleepwear toxic? Most likely not, but it might be uncomfortable because synthetic; the polyester used in sleepwear is a fire-resistant blend, even without additional treatment. In 1977, a toxic fire-retardant called Tris commonly used in sleepwear was banned, and since then most fire-resistant sleepwear has been additive free. We have not found any sleepwear that does use PBDEs as a flame retardant. In any case, washing should dissipate chemical additives, while the CPSC requires fire-resistant sleepwear to be effective through at least 50 laundry cycles…” For information, check out the Green Guide.